Staff was friendly, the interior is a little dated but clean. Breakfast was included and good. I would stay here again. Where to find South Burlington hotels near an airport? Where can I find hotels in South Burlington that are near tourist attractions? 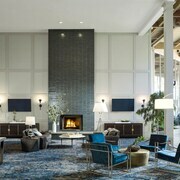 From the budget level to the more luxurious, South Burlington has plenty of quality lodging options. Expedia has at least 36 hotels within a 0.1-kilometre (0.06-mile) distance of South Burlington's center. Looking for a place to stay a short walk from the center of South Burlington? Holiday Inn Burlington and Green Mountain Suites Hotel will suit your needs. 3 kilometres (2 miles) away from the heart of South Burlington is the Travelodge South Burlington. This hotel is a a great option for those seeking cheaper lodgings. 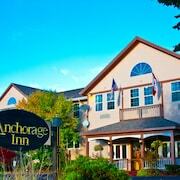 You could also investigate the Anchorage Inn. 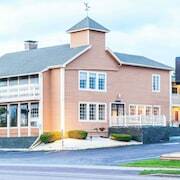 The Hotel Vermont is positioned 5 kilometres (3 miles) from the middle of South Burlington. Another alternative is the Basin Harbor Club, which is positioned 30 kilometres (20 miles) away. 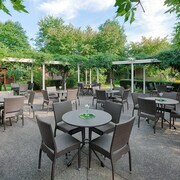 Alternatively you could make a booking at the Courtyard Marriott Burlington Harbor or the The Inn at Grace Farm. If time allows, you might like to discover the other scenic and cultural delights of Northern Vermont. Explore Northern Vermont's open-air markets. You should also take the time to to enjoy the region's forests and mountains. Adventurous travelers might try their hand at snowboarding, skiing and cross-country skiing in this part of United States of America. 9 kilometres (5 miles) away from South Burlington you will find Shelburne, where you can enjoy Shelburne Museum and Vermont Teddy Bears. The Holiday Inn Express South Burlington and Comfort Suites are just some of the fabulous Expedia-listed hotel alternatives in Shelburne. 16 kilometres (10 miles) to the south of South Burlington, you can also stay at Charlotte, which is home to the The Inn at Charlotte Bed and Breakfast and Bryn Meadow Farm and B&B. The Charlotte Village Winery and Mt. Philo State Park are some of the most popular attractions to check out should you visit Charlotte. If sport is your passion, be sure to visit Olympic Center, which is 65 kilometres (42 miles) to the west of South Burlington. Sleep near the action at the The Whiteface Lodge or the High Peaks Resort. 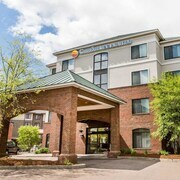 For travelers planning on flying through Burlington International Airport, you may choose to book some accommodation at Sonesta ES Suites Burlington VT, or Courtyard by Marriott Burlington Williston, both of which are conveniently located nearby. What are the most popular South Burlington hotels? 3 BR Home Sleeps 12! Burlington Home - Great Location to Everything!! Are there hotels in other cities near South Burlington? 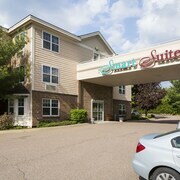 What other types of accommodations are available in South Burlington? Explore South Burlington with Expedia.ca’s Travel Guides to find the best flights, cars, holiday packages and more!